Two republished tales by a Greco-Cherokee author feature both folkloric and modern elements as well as new illustrations. One of the two has never been offered south of the (Canadian) border. 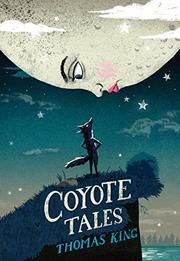 In “Coyote Sings to the Moon,” the doo-wop hymn sung nightly by Old Woman and all the animals except tone-deaf Coyote isn’t enough to keep Moon from hiding out at the bottom of the lake—until she is finally driven forth by Coyote’s awful wailing. She has been trying to return to the lake ever since, but that piercing howl keeps her in the sky. In “Coyote’s New Suit” he is schooled in trickery by Raven, who convinces him to steal the pelts of all the other animals while they’re bathing, sends the bare animals to take clothes from the humans’ clothesline, and then sets the stage for a ruckus by suggesting that Coyote could make space in his overcrowded closet by having a yard sale. No violence ensues, but from then to now humans and animals have not spoken to one another. In Eggenschwiler’s monochrome scenes Coyote and the rest stand on hind legs and (when stripped bare) sport human limbs. Old Woman might be Native American; the only other completely human figure is a pale-skinned girl.